Home News & Analysis MENA 2018 Iranian Protests: A Second Revolution on the Way in Iran? What started off as protests spurred on by the deteriorating economic conditions in Iran and the inflation in prices of basic necessities, escalated into a rebellion against the Islamic Republic itself. But to what extent are these protests threatening the theocratic regime, and could such an upheaval foreshadow a second Iranian revolution? The latest protests, which began in Mashhad on 28 December last year as a backlash to the economic climate in Iran, quickly intensified in nature and in geographical reach, spreading to Kashmar, Isfahan and several other places and lasting well into January 2018. As the Washington Post explained, there are a number of interrelated factors behind the Iranian protests. 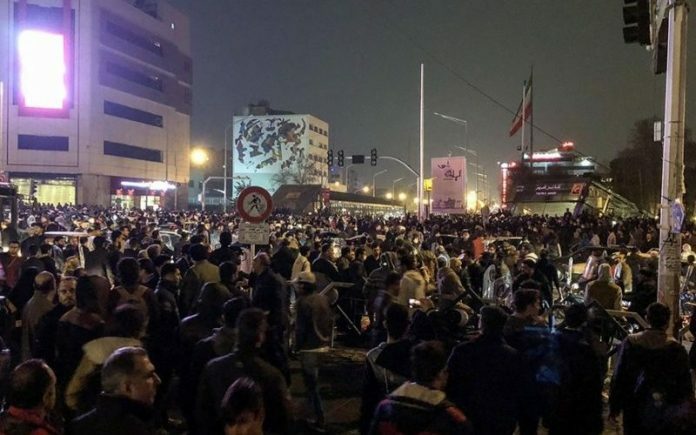 Protests were incited by the leak of President Hassan Rouhani’s financial budget plan, which indicated higher fuel prices in attempts to lower government debt. This came on top of rising unemployment for young people, currently at 40%. Set against poor domestic economic conditions, there is growing anger at Iran’s foreign policy, defined by billions of dollars of investments in the Middle East. This includes the supply of weapons and fighters to Syria, as well as financial support to Lebanese Shiite group Hezbollah. In 2015, President Rouhani signed a deal with world powers which resulted in a reduction of Iran’s nuclear activities in return for lifting the crippling sanctions that were already in place. Despite Rouhani’s promise that signing the deal would bolster economic growth, as previously stated this growth has been far from inclusive. And despite initial optimism around Iran after sanctions were lifted, Tehran is still struggling from a lack of investment. According to CNN, they are the biggest protests since the Green Movement in 2009. Those demonstrations threatened the political stability and legitimacy of the Iranian regime at that time, held in response to the re-election of President Mahmoud Ahmadinejad. Consequently, it is important to assess whether the 2018 protests threatening Rouhani’s regime risk escalating into a second revolution. Essentially, this differentiates them from the Green Movement in 2009, and the Iranian Revolution in 1979. Both of these past movements were de facto socio-political movements with economic components, rather than vice versa. Socio-political protests threaten regime stability and longevity, whereas economically driven protests are more likely to exert pressure for action from the government. Many Iranians are seeking improved livelihood which can be achieved through the incumbent regime, especially as the economy has come out of recession since 2015. Economic growth in Iran in 2017 was a solid 5.3% for GDP. There are foundations in place for improved employment and living conditions. The scale and geographical reach of these protests is actually much smaller than previous uprisings in the country. Consequently they have not engendered an endemic panic across other regions in Iran. The view of Rouhani himself is that the regime is comfortably equipped to deal with incidents like this. Part of this composure on the part of the regime is also likely due to their relative receptiveness to the pleas of protesters. Iran’s parliament ultimately rejected the 2018 budget plan that proposed an increase in the price of petrol by 50%, and also rejected any calls for increases in the price of water, electricity, and gas. This apparent and genuine responsiveness from the regime should reduce the risk of future violence or the likelihood of protests escalating into a fully-fledged revolution. Taking the matter more seriously, President Trump denounced the Iranian regime for inflicting repression on the Iranian people for years. Trump tweeted that Iranians ‘are hungry for food & for freedom’ and that ‘[a]long with human rights, the wealth of Iran is being looted’. This reaction is typical of Western powers’ perception of the theocratic regime as one that suppresses human rights and civil liberties. This perhaps suggests how western media outlets believed it was in their interest to emphasize the intensity and seriousness of the protests in Iran. Overall, these demonstrations are best viewed as part of Iran’s socio-economic scene. Although twenty people died in clashes with security forces, the latest demonstrations did not reach the intensity or severity of previous protests in the country. In this case, due to the small scale and specific causation of the protests, the risk of a second revolution is highly unlikely. The government has shown it is at least partially responsive to citizens’ concerns, although ongoing economic and social inequality will help to ensure that common grievances do not disappear any time soon. Previous articleWhat’s Behind the Upcoming Western Military Intervention in Syria?